This evening we had the BEST dinner EVER! 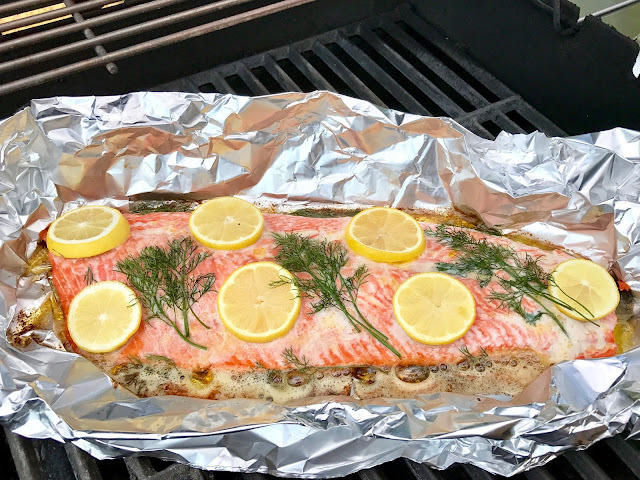 I roasted fresh wild Copper River Salmon and cooked it on the grill in a large foil packet, seasoned with sea salt and topped with pats of Kerrygold butter, fresh dill, and sliced fresh lemons. It was our first Copper River Salmon of the season. It was simple and so delicious. 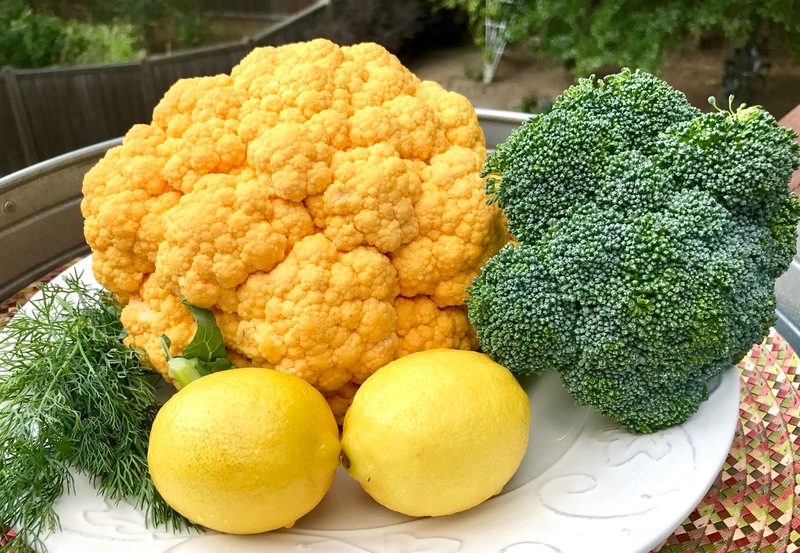 For our sides, I made my Rich & Thick Cauliflower Mash using a head of yellow cauliflower that I picked up at Sprouts. I also steamed some fresh broccoli to go with our meal. It was one of the best meals I've had in months. 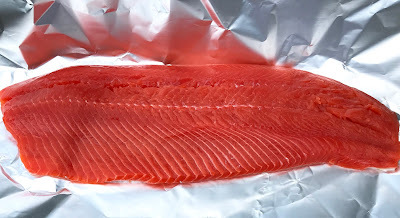 I actually prefer wild Copper River Salmon over steak, chicken or any other seafood. Both hubby and I enjoyed it. Even Spike enjoyed it; we always share it with him because it's one of his favorites too. I've been searching for Copper River Salmon for almost 2 weeks and haven't found it anywhere...until last night, that is! After work yesterday, I made calls all over the area to see who had received their shipment of Copper River Salmon (up until last night, I haven't found it anywhere nearby, except for one place at $60/lb). I hit the Copper River Salmon lottery yesterday though because our Costco had just received their shipment that morning. We grabbed our coolers and headed out. They had 22 packages of the wild Copper River Salmon, of which I purchased 8 packages (I didn't want to be too greedy). The funny thing is that usually they put it in a case all by itself but last night they put it in the same case as their farmed salmon; on the left it was wild Copper River Salmon and on the right side it was the farmed salmon and what a difference...the farmed stuff doesn't even remotely resemble the wild salmon; not in color or texture. 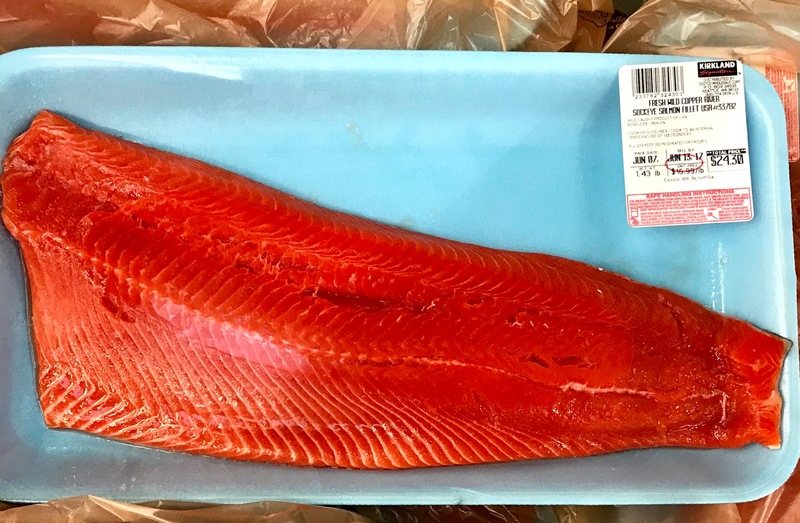 It looks sickly and anemic beside the Copper River salmon. Anyway, I brought home between 15 to 16 pounds of salmon...LOL. I was afraid I might not find it again and I wanted to make sure I had plenty "just in case." 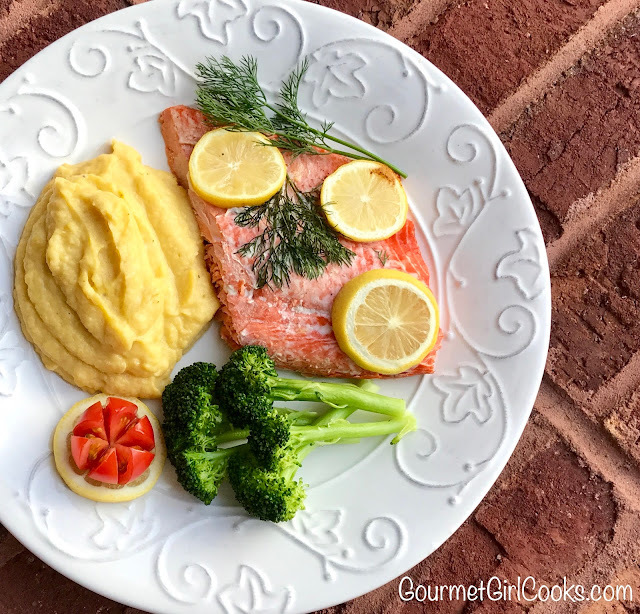 I snapped a few photos of my meal below as well as included the super simple recipe for salmon roasted outside on the grill (perfect for this hot weather). Enjoy! Place salmon fillets in center of large sheet of foil. Season with salt. Arrange pats of butter, lemon slices and dill over top of fillet. 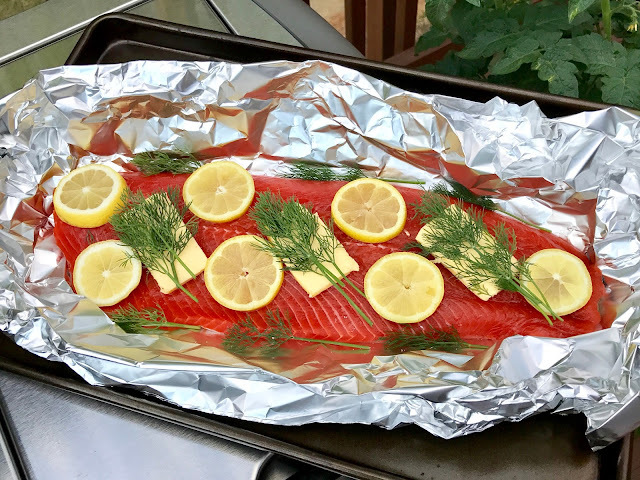 Gently crimp and form foil into a packet around salmon fillet to hold butter and juices as it roasts (keep packet open on top while roasting). Place on hot grill and close lid. Try and maintain grill temperature between 425 and 450 degrees F. Cook for 10 to 12 minutes. 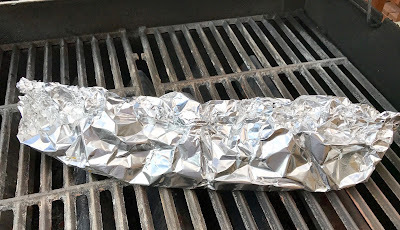 Remove and transfer foil packet to a platter or baking sheet. 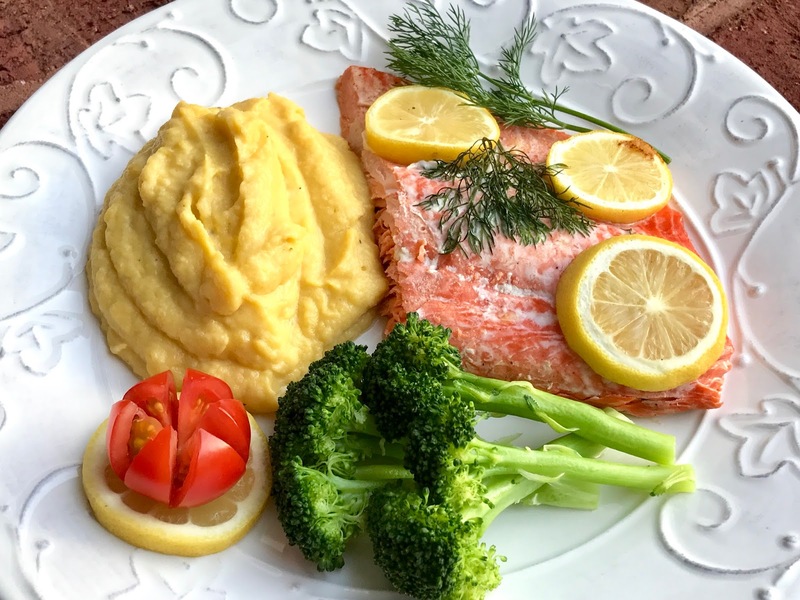 Crimp and close packet tightly to allow salmon to continue cooking gently off the heat for about 5 to 10 minutes. WOW! Is this gorgeous or what! Our absolute favorite, too. We're going to have to get down to our Costco pronto!